Every time we seem to be making progress in the way women are portrayed in magazines, somehow we take a step back. 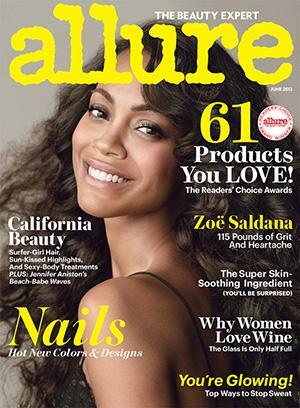 The latest reminder that we still have a ways to go is that Allure magazine's latest cover, featuring gorgeous actress Zoe Saldana, describes its cover model as "115 Pounds of Grit and Heartache." While that may be true, readers probably didn't need to know precisely how much "grit and heartache" she possesses. It's not clear if or how the number fits into the piece since the full interview with the actress has yet to be released but when omg! inquired about the headline, Saldana's rep referred omg! to Allure, who in turn said "no comment." Whomever is responsible, the decision to showcase Saldana's digits seems so … unnecessary. Hilary Levey Friedman, a Harvard sociologist who often writes and speaks about images in the media, calls it "an interesting choice," particularly because many of today's women focus on Body Mass Index rather than the numbers on the scale. The message to women on the Allure cover, she says, is that "you need to be thin and strong. Just one isn't enough anymore. This only puts more demands on women and can lead to varied types of disordered eating." Friedman adds that the headline harks back to another era. "It used to be common to share numbers like weight and measurements," she continues. "While it is still common within the modeling industry … more mainstream pop culture has shied away from it. Even the Miss America Pageant stopped listing the weights and measurements of its competitors by the 1990s." Not long ago, it seemed possible that readers of women's glossies would see a change. In 2007, the Council of Fashion Designers of America voluntarily began to ban women who were younger than 16 from the runways. Their counterparts in Spain and Italy said they'd no longer use models who fall below a certain BMI level, and Israel passed a law against the use of models deemed too skinny. Then in May 2012, Vogue, the unofficial fashion bible, vowed that the 19 editions of the magazine around the world would "project the image of healthy models," according to a press release. It would "not knowingly work with models under the age of 16 or who appear to have an eating disorder," and even check IDs at fashion shows and photo shoots. It seems odd that it took Vogue that long to adapt to what seems like common-sense guidelines, but, hey, at least it was something! Two months later, a 14-year-old decided to take the issue into her own hands when she launched a campaign, complete with a demonstration and an online petition, to get Seventeen to publish one unaltered photo spread per month. Seventeen's editor Ann Shoket claimed the mag had not and would never do considerable retouching, and promised to use only "real girls and models who are healthy." On her cover and in the accompanying photo spread, Saldana looks healthy and glowing, which begs the question of why the number was included at all.